Every 16th day of the Lunar New Year, Heart Guy and I travel to his family home in the Mekong Delta to commemorate his mother’s death and celebrate her 96 years of life. This year, he’ll be going on his own as I’ll be at the Irrawaddy Literary Festival in Mandalay talking about As the Heart Bones Break, my novel about 60 years in the life of a Vietnamese man.It’s just this year, Heart Guy and I said to the family. Anyway, the book, in its own way, also celebrates my mother-in-law’s life and times. So I was all set for Myanmar, no regrets. But just today a lovely friend who’s a Mekong Delta cook par-excellence sent me these mouth watering pictures of the region’s delicacies. Here’s what I won’t be eating on the 16th Day of the Lunar New Year. 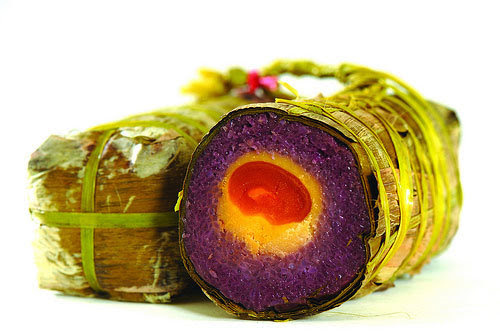 Ceremonial Violet Rice Roll. Photo Credit: Whoever you are, thanks for these pictures I received from a wandering email. 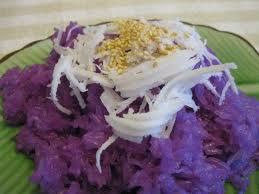 Violet sticky rice is made by soaking glutinous rice in an infusion of purple “cam” leaf. For the sticky rice rolls used for ceremonies (see featured image) the ‘cam’ leaf infused rice is fried with creamy coconut milk before being rolled up in banana leaves with pork, smashed yellow beans and the salted egg-yolks from free-range duck. Not to be missed for New Year! But Heart Guy’s ordered some to bring home, so it’s only the company I’ll be missing. Breakfast Violet Sticky Rice. Photo Credit: To whoever took these beautiful pictures from a wandering email, thank you. A simpler version for breakfast is plain steamed violet rice. This is topped with shredded coconut and garnished a dollop of coconut cream and sprinkles of salted fried sesame seeds and sugared crushed coconut.Yum. This is my favourite Mekong Delta breakfast. It’s a great way to start the day. Grilled banana and sticky rice. Photo Credit: To whoever took these beautiful pictures from a wandering email, thank you. Yup, this is another hearty breakfast staple. 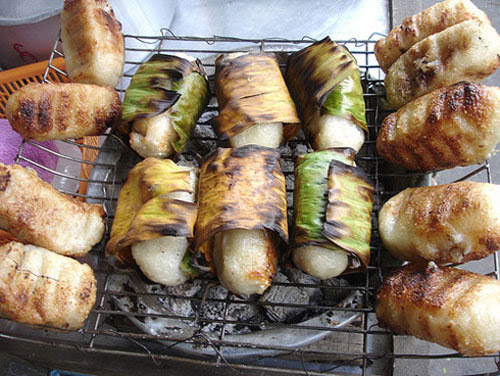 Bananas from the Delta are tiny and svelte; just right to wrap with a coating of left-over sticky rice and banana leaf. These are set out to grill nice and slow through the early morning chill. They’re ready to eat when the banana leaves are charred and the rice-is nicely brown, a signal that the lovely sweet banana inside has baked to just the right degree of mushy sweetness. I like my roasted banana’s plain. Real Mekong Delta folk, modern ones at least, get the vendor to slice the roll in half and tumble it into a little plastic bag with a nice coconut-tapioca gravy and the ubiquitous sesame and peanut garnish. Either way this beats cereal I can tell you. And, it’ll keep you going all the way till lunch. Grilled snails with green peppercorns. Photo Credit: To whoever took these lovely pictures in a wandering email, thank you. These fist sized babies come from the surrounding padi fields. We boil them quickly then throw them face up over a smouldering charcoal fire, slipping in a teaspoon of seasoning made from fish-sauce, green peppercorns, garlic, chopped chillies, chopped scallions and a spot of oil. They’re ready to eat when the liquid in the snails begins to boil. We accompany these appetizers with cold beer. It’s not quite the done thing to be drinking so early in the day, but parties in the Delta always start in the late morning so people can get back home before dark. And it keeps the non-cooks happy until the really sinful fried stuff appears! Sizzling pancakes. Photo Credit: To whoever took these lovely photographs in a wandering email, thank you. 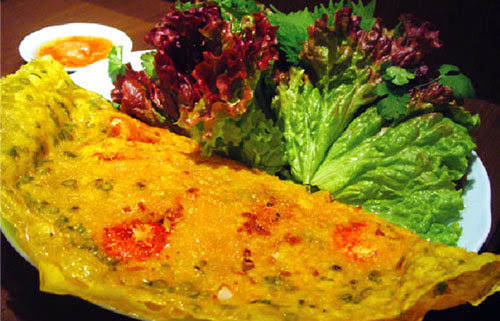 Foot wide sizzling pancakes are a Mekong Delta specialty. Made with a batter of rice flour, tapioca flour and coconut milk, seasoned with fresh turmeric essence, and fried in thick iron black iron woks over a wood fire, they’ve an earthy richness I just can’t replicate on a gas stove in a city. The pancakes are stuffed with sliced belly pork, very sweet little school-prawns, a sprinkle of yellow beans, some onion rings and lots of bean sprouts. The secret is to put the belly pork into the pan first so the fat seasons it, then to pour the batter over the meat and sprinkle the prawns on top immediately before waiting for the pancake to set. This way you get a nice crispy combination of meat and flour. After which the veggies are added and then the pancake folded over and served. To cut the grease we wrap bite-sized pieces of pancake in spicy young mustard leaves. Mekong Delta people also add all kinds of fresh herbs and flowers. It’s a great way to pass an afternoon, filling and folding the little parcels of pancake and vegetables and chatting. Then getting up to take your turn in the kitchen as the first set of cooks comes out to eat their share. We do this for a couple of rotations, after which, stuffed to the gills, everyone wanders off to his or her special corner or hammock to sleep the sultry afternoon away. Savoury fried cupcakes. Photo Credit: To whoever took these lovely photographs in a wandering email, thank you. Come four o’clock, it’s time for showers and then good-byes. But the road home may be long and it isn’t right to let relatives go home without a little snack. It’s time to fry up the cup-cakes. Savoury fried cup-cakes are a cheap way to feed a dozen or more from what’s left over from lunch. The lunch batter, san’s coconut milk and turmeric, is mixed with an extra helping of glutinous rice. 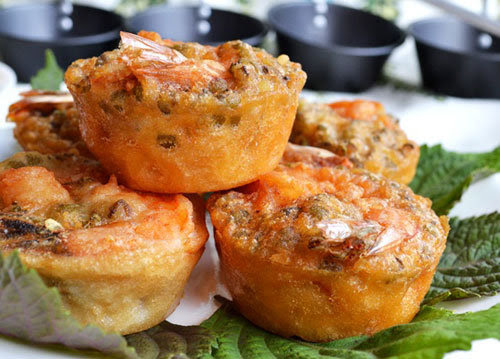 A soup-like cupcake ladle is dusted with flour, layered with some yellow beans, chopped pork, prawns and onions and topped up with batter. The ladle is gently lowered into hot bubbling oil and before long a cooked cup-cake floats out. These cup-cakes are delicious fresh out of the pan with a sweet-sour fish-sauce dip. And since they’re so easy to make, there’s always enough to put into a brown paper bag to bring home. I won’t be putting on extra kilos this year, that’s for sure. Instead of food for the tummy, I’ll be feasting on mind-food. I’ll be chatting with literary luminaries like Thant Myint U, Karen Connelly and Jung Chang, writers I read with relish whose talent I envy. For something given up, something’s gained. The only thing I will really regret is the warmth of my Mekong Delta family and a Valentine Day without Heart Guy. Yup, the 15th and 16th Day of this Lunar New Year is also Valentine’s Day weekend. The things I do for literature! You know what a foodie I am. I would love to try some of the dishes you have described. You are spoiled with riches of diversity of culture. Enjoy the intellectual stimulation of your trip. Maretta… remember Lo Hei? We had 6 Lo Hei this new year. No more raw fish for me till next year. 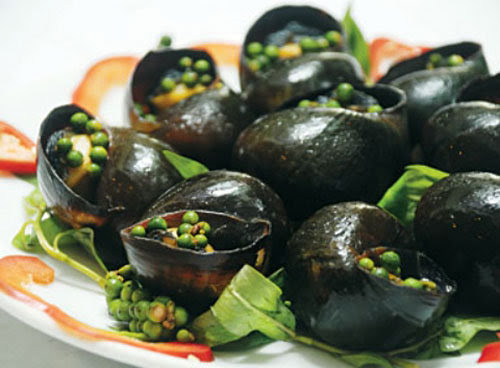 Looks divine, Im a bit squeamish about the snails even though the way they were cooked sounds good. You have such a choice of foods Audrey and even though its early here Im hungry now. Thanks for sharing your wonderful world it is never dull. Yes, they’re scary aren’t they Kath? I start with eyes closed and nose pinched tight. They do grow on you though.